A resistance temperature detector works by tracking the linear change in electrical resistance of a pure metal — like nickel, copper, or platinum — that’s caused by a change in temperature. An RTD element consists of a length of fine coiled wire wrapped around a ceramic or glass core. It is fragile, and usually protected by a sheathed probe. Since platinum has a wide temperature range, and produces highly accurate and stable measurements, it’s the most common RTD material. A thermocouple consist of two different electrically conductive metal alloys. Together, they produce a voltage that’s proportional to the temperature difference between either end of the pair of conductors. Combinations of specific alloys produce a predictable difference between temperature and voltage (e.g., Type J thermocouples, made of copper and constantan, have a range of 32° to 559°F with a standard error range of ±4°). Cons: Not as accurate as RTDs, signal stability degrades over time, and can require frequent replacement, especially in high temperatures. Subject to “cold junction error”, a degradation of the millivolt signal that varies based on the ambient temperature where the measuring device is installed. So, with a very basic understanding of how these sensors work, we turn our attention to your application and your specific needs. Either an RTD or thermocouple will work. Go to Decision Factor #2. You’ll most likely want a thermocouple. Go to Decision Factor #2 to verify. For high temperature applications, you’ll need a thermocouple. RTDs don’t function at these high temperatures. If accuracy isn’t critical, or you need a more rugged, durable sensor for high vibration applications, a thermocouple is the way to go. Which One Do I Have Now? So, you’re replacing a temperature sensor, and it’s not clear which one you have. Here’s how to tell. Though they do come in two-wire and four-wire varieties, most RTDs are three-wired sensors, where two wires are one color and the third is another. The problem is that no two RTD manufacturers follow the same standard. Thermocouples are two-wire devices, and follow an industry standard for wire colors. 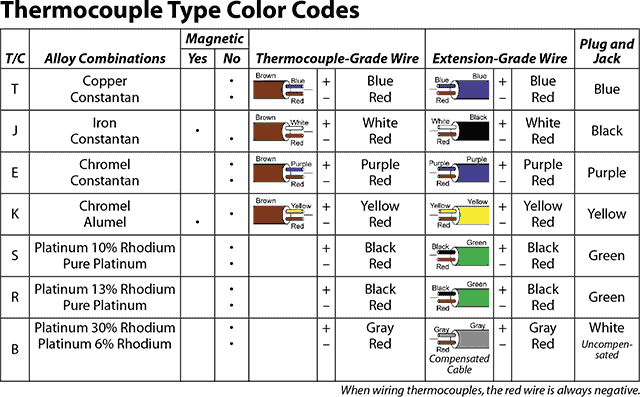 The chart below can help you identify the thermocouple type you have. The chart comes from page 489 of the Lesman catalog’s reference section, along with standard wiring diagrams for thermocouples and transmitters, thermocouple material tolerances, and more. How do you keep production going when a control thermocouple burns out? This entry was posted on February 9, 2012, 10:54 am and is filed under Burner Control, Combustion, Cost Issues, Flame Safety, Installation, Measurement, RTDs, Temperature, Thermocouples. You can follow any responses to this entry through RSS 2.0. You can leave a response, or trackback from your own site. i like the short and to the point writing style.